. With thousands of textbooks from top publishers, we have a comprehensive selection of higher education titles from science and mathematics to history and English, and everything in between. With Google Play Books, your textbook library is stored in the cloud and synced to your devices, giving you instant access to the titles you need, when you need them, on your Android tablet, phone, iOS device, or on the web. An overstuffed backpack is a thing of the past. If you only need your textbooks for a semester or two, you can choose to rent any textbook on Google Play for six months and save up to 80% as compared to buying print textbooks. Counting down to the start of classes this fall? Time is running out to get through the back-to-school checklist: confirming class schedule, getting new gear to decorate your dorm room, checking out school activities, and of course, buying textbooks. We can’t help with everything on your list, but we can lighten your load, literally. 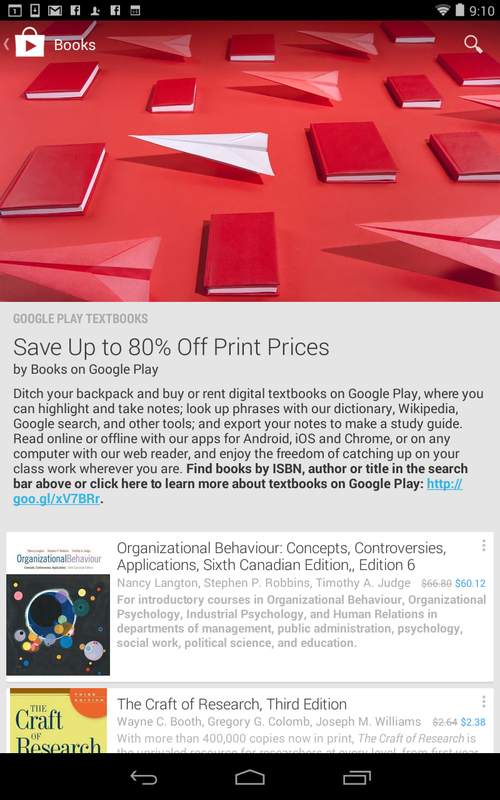 Starting now, students in Canada can rent or purchase digital textbooks from play.google.com/textbooks. With thousands of textbooks from top publishers, we have a comprehensive selection of higher education titles from science and mathematics to history and English, and everything in between.